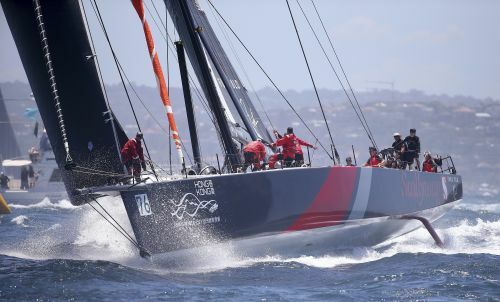 SYDNEY (AP) — Supermaxi Black Jack was the first yacht through Sydney Heads for the second successive year, but 2017 winner Comanche has surged into the lead in the 74th Sydney to Hobart Yacht Race on Wednesday. After three hours of racing, line honors favorite Comanche was setting a fast pace of around 27 knots, benefiting from north-easterly winds along the New South Wales state coast and had a lead of four nautical miles from supermaxi rivals InfoTrack, Wild Oats XI and Black Jack. Earlier, In front of tens of thousands of onlookers on the shore and a flotilla of spectator boats on Sydney Harbour, Black Jack reached the first rounding mark at Sydney Heads in a little over 13 minutes just ahead of InfoTrack and Wild Oats X, with Comanche rounding the mark in sixth place. International entry Sun Hung Kai Scallywag from Hong Kong was fourth through Sydney Heads, but soon became one of two early retirements from the 85-strong fleet when the supermaxi sustained a broken bow sprint. The other retiree was TP52 Zen which withdrew due to rig damage. Comanche, skippered by Jim Cooney, set the race record of 1 day, 9 hours, 15 minutes, 24 seconds while winning the 628 nautical mile passage to Hobart, Tasmania last year in controversial circumstances. First-place finisher Wild Oats XI, which has won line honors nine times, was given a one-hour time penalty for an illegal tack on Comanche while still in Sydney Harbour, giving Comanche the win. This year's race features its first all-female crew, skippered by Australian Stacey Jackson but with sailors from Britain, New Zealand, the U.S. and the Netherlands. The tactician on Wild Oats X is Australian Katie Spithill, sister of America's Cup racer Jimmy Spithill. This edition is also the 20th anniversary of the infamous 1998 race where six sailors died after the fleet was hit by a large storm.